This year, instead of buying presents for family and friends, my husband and I have decided to put together a hamper of goodies including a Christmas Cake, as well as Port, Chocolate and Cheese (Ducketts Caerphilly which we selected from Neal’s Yard Dairy in Borough Market). With 9 cakes to make in total I have decided to go with 3 different designs, all using my tried and tested Fruit Cake Recipe. 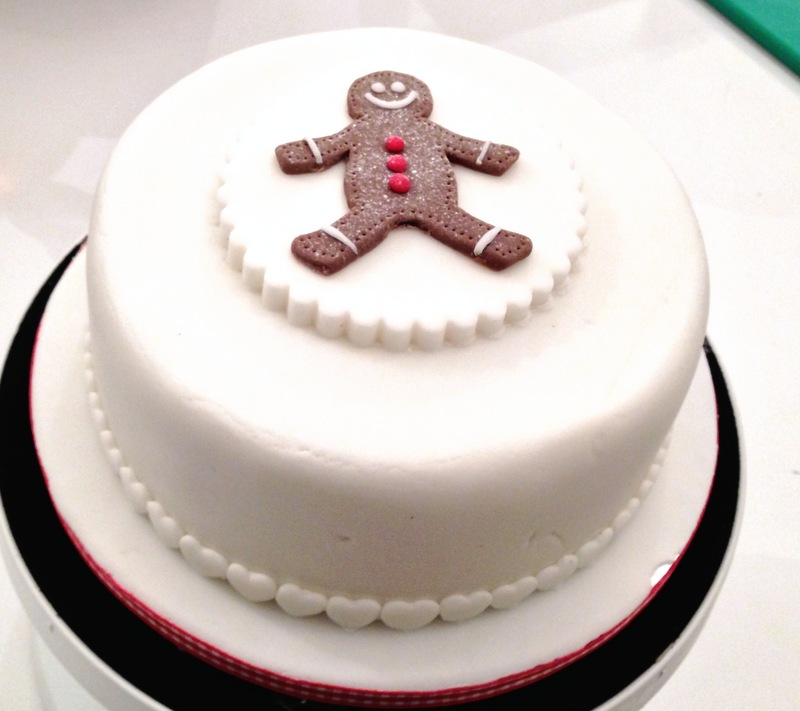 The first design I created was my Gingerbread Man Christmas Cake. For this I made 6 inch round fruit cake cake which I covered in Marzipan and white sugarpaste. I then coloured some leftover white sugarpaste ‘bulrush’ brown and cut out a sugarpaste gingerbread man using a handmade template. I added his features (eyes, mouth, red buttons, stitching marks around the edge) and dusted him with a little icing sugar before putting him on the top of the cake. I had already covered a drum board in white icing with a red gingham ribbon around the edge. To hide the join between the bottom of the cake and the board I put a border of hearts (also cut out of white sugarpaste) along the base of the cake. I found this to be a great cake to decorate where time is against you. Other than the gingerbread man, there is no real faffing around required so it probably only took an hour or so to decorate, but the results were quite effective I think.